With almost 5 years of downtime, Project NSX has been on hiatus for way too long. Between FXMD moving from Las Vegas to California, the motor traveling from Vegas to NorCal to SoCal, and especially with me moving to North Carolina, our little NSX has not had quite the love and attention that she deserves. But our 4th installment gets us back on track (literally) with a new set of shoes. 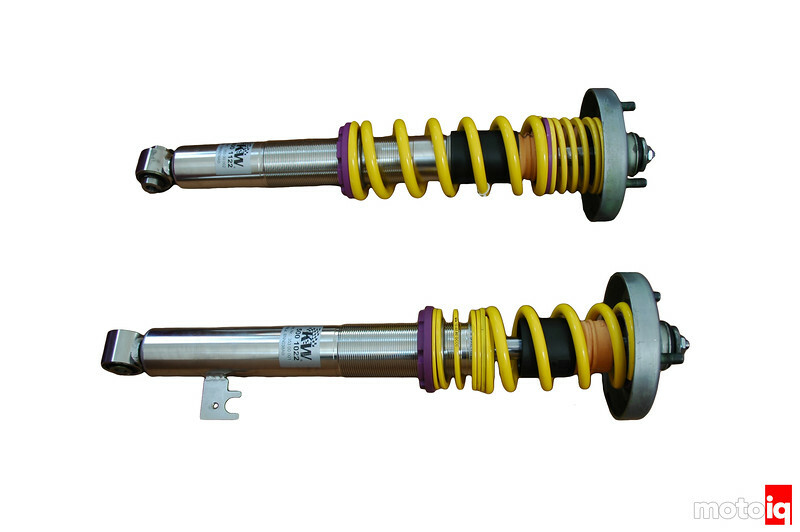 It seems like pretty much every project car on MotoIQ has KW coilovers, and for good reason, they are excellent dampers. 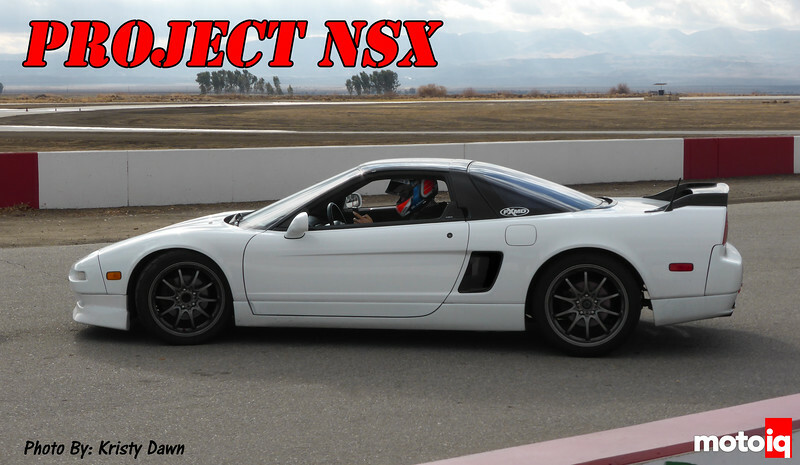 However, Project NSX was actually one the first projects to receive KW V3s way back in August of 2009, it just took until now to write about them. As a long-term update, I can’t really say a whole lot more than what has already been said about KW’s excellent valving, performance, and ride quality other than after tens of thousands of street and track-driven miles, these KWs have been flawless with no leaks or issues whatsoever. There’s a reason why they are OEM equipped on some pretty awesome cars like Mercedes’ Black Series cars. The NSX-specific KW Variant 3 utilizes 343lb spring rates front and rear and uses the durable OEM rubber mounted top hats for comfort and reliability. With over 150K on our rubber top hats, Honda seems to have designed these pretty well compared to most other cars, and new ones should last forever without needing the maintenance that Monoballs require. KW does offer a clubsport version with heavier 457lb spring rates and monoball top hats. We opted for the 457lb clubsport rates and V3 top hats. The NSX was ahead of its time in many ways. The design of the all-aluminum chassis, subframes, control arms, and uprights rival those used in modern supercars. The control arms are aluminum masterpieces that look more like sculptures than what you see in today’s supercars. The suspension geometry is so good that the country’s fastest time attack car, the FXMD FX750 NSX, utilizes the stock control arms and pick up points and just turned a record-setting 1:37.520 at Buttonwillow. With the V3s now installed, we examine the unique design of the NSX’s front suspension. 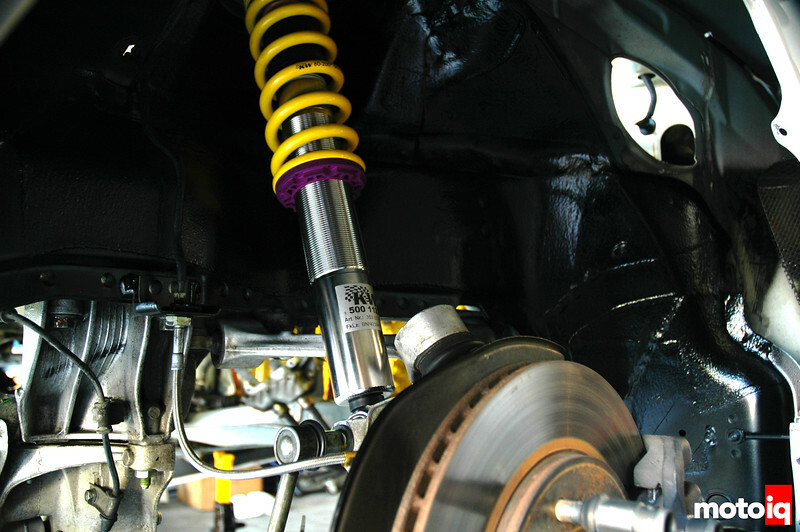 The damper bolts to near the middle of the lower control arm which lowers the motion ratio and wheel rate. 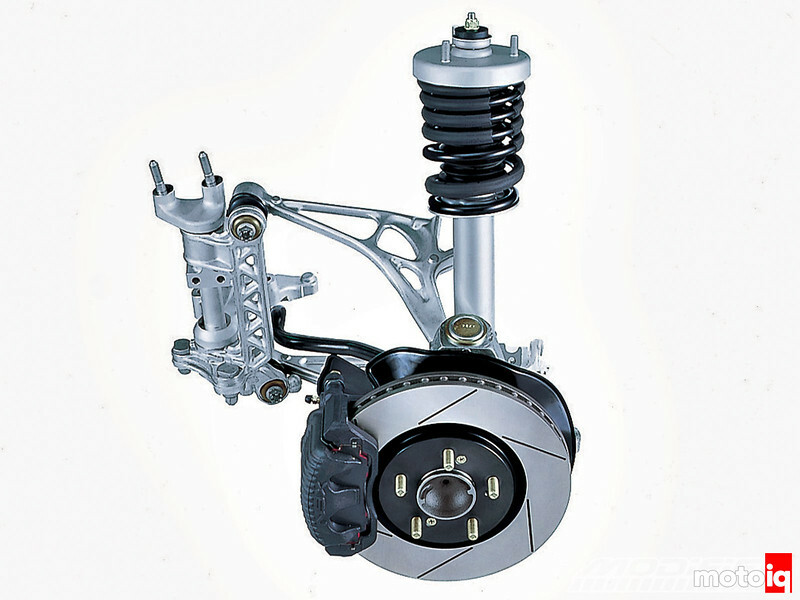 The front mounting point of the upper and lower control arms are connected via ball joints to what is known as a “compliance pivot”. This rubber-mounted vertical bracket with triangulated webbing pivots to absorb shock and allow for longitudinal deflection of the wheel to improve ride quality. Most people who track their cars install a clamp here to prevent the movement for a more consistent alignment control on track, but we’ll leave it alone for now. Honda spent a great deal of time, money, and effort to develop the NSX. With the goal of beating Ferrari in every category, Executive Chief Engineer Shigeru Uehara had set the target for Honda's new supercar extremely high. During the late 80's, Honda had a significant amount of development resources at their disposal and made use of them. Since Honda was powering McLaren's F1 program at the time and powered all three of Ayrton Senna's wold championships, it didn't hurt to have access to one of the greatest drivers of all time. Senna was a crucial tool in developing the handling balance of the car. He is also credited for the car's strong chassis rigidity and cornering capabilities after testing the prototype which he felt was not stiff enough. He was also said to have tested the NSX at the Nurburgring amongst various other tracks. 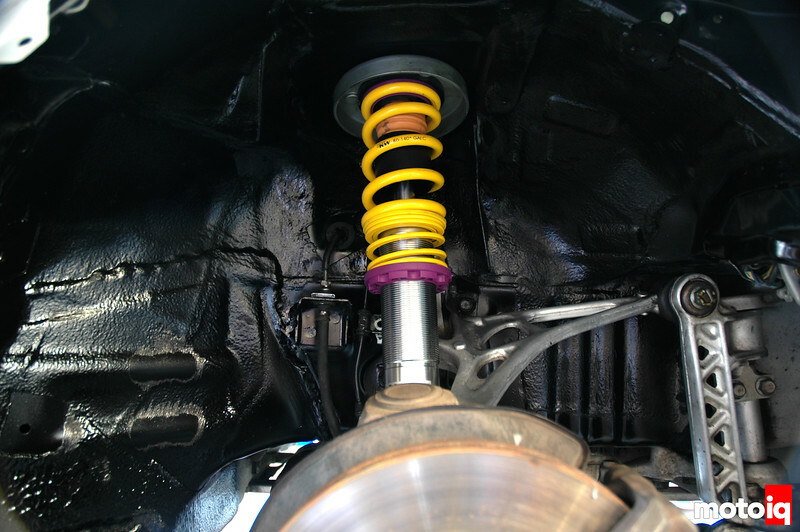 The use of unequal length upper and lower control arms are prevalent on all four corners of the NSX's suspension. The rear suspension layout is also very interesting. 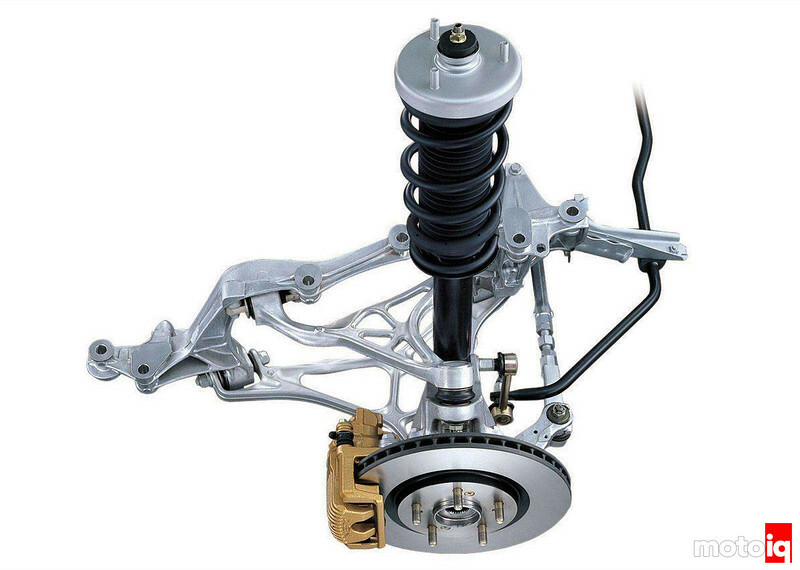 The damper bolts directly to the upright giving the rear suspension a high motion ratio, closer to that of a strut. The rear swaybar’s ball joint is actually the bolt for the lower shock mount.